Lately I have entered a circle that I find difficult and I do not want to leave, we are not going to fool ourselves. The thing is, I can’t stop making cakes. Not only do I enjoy making them, which for me is almost therapy, but I also enjoy eating them of course. At home I don’t get any hiccups… So I have free way to do all the things I can think of! This time I bring you another classic, yes I know, I’m a little “old-fashioned”. But hear how good are the recipes of all life. Today we will see how to prepare the famous and incomparable Opera Torte. This must be the sin of heaven or the temptation of the Gods… If you like coffee and chocolate, you are lost. Really, it’s not a way of speaking, it’s a fact. You will start to eat, you will feel an immense happiness and you will not be able to stop. 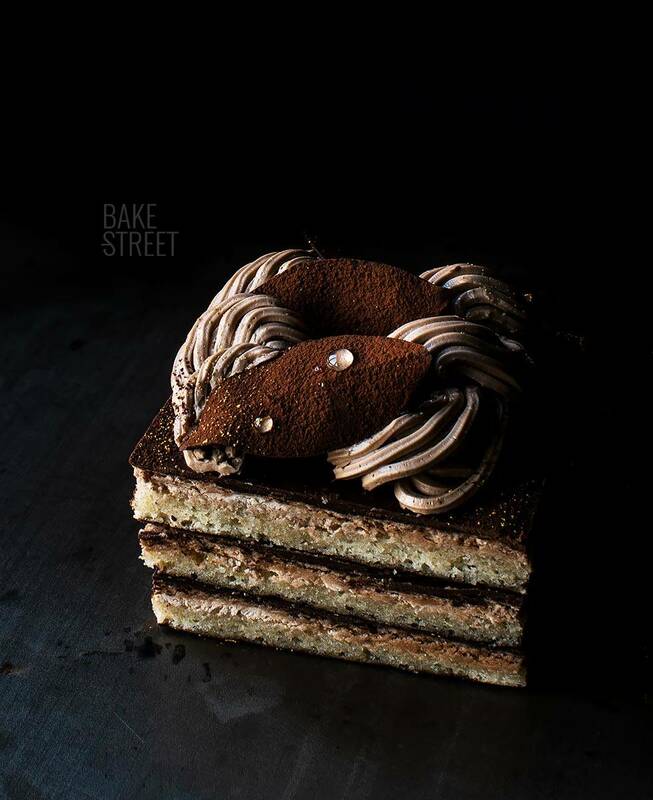 The elaboration of the cake was followed by the book “Baking and Pastry”. With the recipe and following the cuts that I have made, we obtain 2 cakes of 10 cm of side and one of 10cmx5cm. 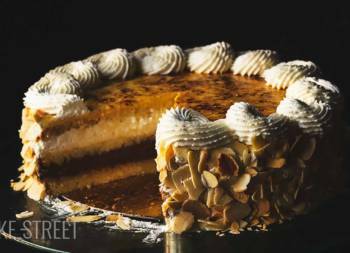 Opera Torte is a classic creation of French pastries with a somewhat uncertain origin. There are two stories that tell how this cake could have taken place. The first of these dates back to a Culinary Exhibition in Paris in 1903. 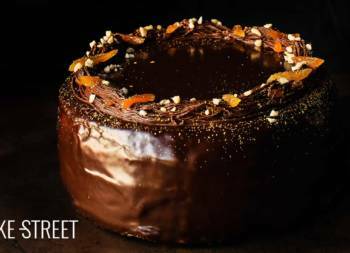 Louis Clichy, from whom the cake takes its name, presented this preparation to the attendees and made them fall in love with it. 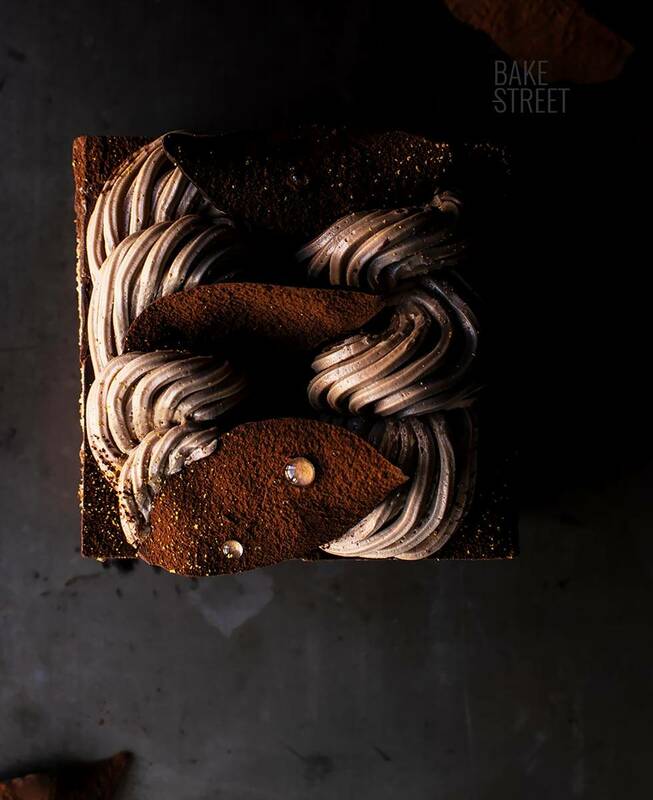 The second tells us that in 1955, Cyriaque Gavillon, a pastry chef from Dalloyau, founded in 1682, created a cake consisting of three layers of Joconde sponge cake, soaked in coffee syrup and filled with a cream of coffee butter and chocolate ganache. However, it was his wife Andrée Gavillon who gave the name “Opera” in homage to some Ópera Garnier dancers who came to his shop. To this day, it is still the best-selling cake in Dalloyau. Gastón Lenôtre in the 1960s, claimed that the invention of this cake was his own. Also known as Gioconda sponge, this is a sponge that could be defined as a Genoese sponge made with almonds. The peculiarity of this sponge is that it must have a fine thickness, but at the same time be able to achieve a very juicy result after soaking it in coffee syrup. Thanks to the large amount of almond it contains, we will be able to achieve a cake that is consistent enough so that it does not crumble after being soaked. In addition, we already know that everything that contains nuts prolongs its useful life because it helps maintain its freshness and juiciness. The process to do this is simple, but requires several steps. When it comes to baking we can do it in 2 ways. On the one hand I show you in the video piping the batter on a tray lined with baking paper or directly pour the mixture on a large tray with a bottom lined with baking paper. In my case I chose the first option because my bottom tray was narrower than the perforated tray and I would not have achieved a plate the size I wanted. But I want you to keep both options in mind and use the one you find most comfortable and simple. I have to admit that until recently I wasn’t very much of a fan of Swiss Meringue Buttercream. But I have always been fascinated by the texture and how easy and grateful it is to work with it. I don’t think any other cream allows us to achieve a finish as clean and perfect as this one. Place the egg whites with the sugar in a water-bath with gentle heat and mix with a whisk until the sugar dissolves. The temperature that we must reach in the whites is 165ºF/74ºC. We must whip the egg whites until we get a firm, shiny meringue. Patience, this step is very important. In addition, it must completely lose heat, this process can take at least 10 minutes. Butter should be at room temperature when integrated into meringue, otherwise cream may be separate due to temperature difference. If this happens to us, we must put the cream in the freezer for 5 minutes. Then we continue beating. This cream should be used at room temperature. When refrigerated it becomes very hard and takes a few hours to lose the cold. And when I say several hours is not 2, in winter it can be 5-6 hours. The other filling we’ll use is a dark chocolate ganache. Easy, exquisite and always with good results. The decoration I leave you is not the classic and traditional, not because I don’t like it, I love it. But I wanted to do something different while maintaining its traditional elements and process. Of course, you already know that it is a suggestion of presentation and that you can vary it to your own taste. Line a perforated tray with baking paper. Set aside. Sift the flour, set aside. Sift the ground almond, set aside. In the bowl of the KitchenAid or a stand mixer, add the eggs along with the sugar and salt. Beat, increasing progressively the speed without reaching the maximum, until reaching the rippon stage* (see in NOTES). On the other hand, in a bowl we add the egg whites. Begin to whip them at the lowest speed and gradually increasing the speed without reaching the maximum. As soon as they start to foam we will add the icing sugar little by little and whipping at the same time. Once we have all the icing sugar incorporated, we will continue whipping until obtaining a firm and brilliant meringue. Set aside. Mix the almonds with the sifted flour. Begin to add the dry ingredients, little by little, to the whipped eggs. We will do it with enveloping movements helping us with a spatula. Integrate the whipped egg whites to the mixture and homogenize with enveloping movements. Finally, add the melted butter and integrate again with enveloping and soft movements. Place the mixture in a piping bag. To prevent the ends of the paper from lifting or moving when you pipe the batter, place a few small "points" of batter in the corners. In this way the paper will remain fixed. Cut the tip of the piping bag and pipe the batter. Make a rectangle and then fill the inside trying to exert the same pressure all the time. If we have more batter in the piping bag, we will create lines around the rectangle. Place in the oven for 9-10 minutes. We will see that it acquires a light golden color for the surface. Also, if we press the surface of the cake, it will return to its initial state. Remove from the oven and let it cool completely on a rack. If we are going to use it the next day, once it is completely cold, cover it with film and leave it at room temperature. Pour the water with the sugar in a saucepan. Place at medium heat and let it boil. The sugar should be completely dissolved. Once it comes to the boil, turn off the heat, add the crushed coffee beans and let it cool completely. Place the syrup in a bottle with the help of a funnel, add Frangelico to taste, close and shake to mix well. 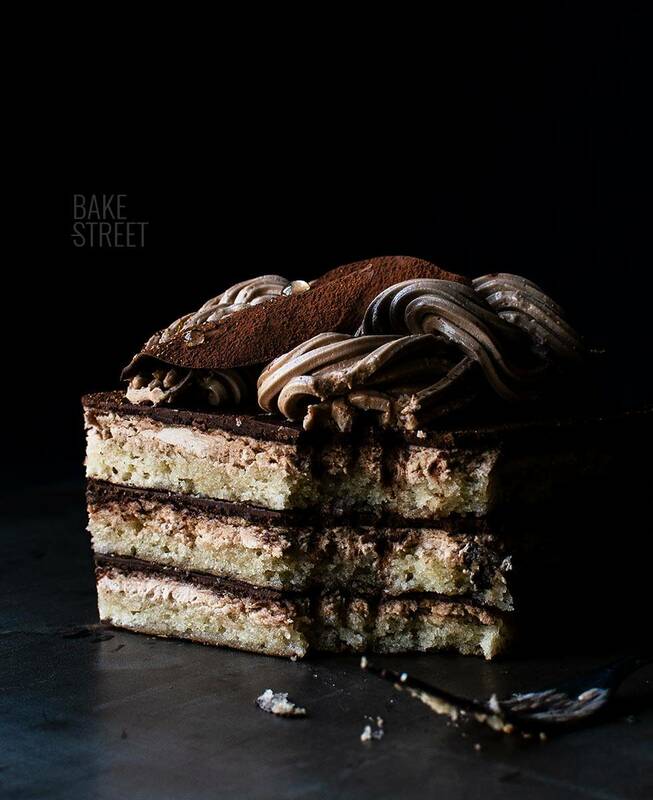 Make coffee Swiss Meringue Buttercream. In a heat-resistant bowl, add the egg whites along with the sugar. Place on a water-bath at medium low heat. Stirring constantly, leave until the egg whites reach 165ºF/74ºC. For it we will help ourselves of a digital thermometer. Remove from the heat, pour the egg whites into the bowl of the KitchenAid or a stand mixer and whip at medium high speed until a firm and shiny meringue is obtained. Once we have the firm meringue, begin to add the butter cut into squares little by little and at the same time the mixer continues whipping. Once we have all the butter added, increase the speed and finish whipping. Stop, scrap the cream with the help of a spatula and add the coffee paste or, in its defect, the Nocilla® together with the essence of coffee. Taste and rectify until the desired flavor is achieved. Whip again at high speed until the ingredients are completely integrated. Put 210 g of Swiss Meringue Buttercream into a piping bag with a Russian tip Decora nº10. Chopped finely black chocolate, set aside. Pour the cream into a heat-resistant bowl and place in the water bath. Leave until it takes temperature but without boiling. Remove from the heat and add chopped chocolate, mix until smooth. Pour in a medium bowl and let cool completely at room temperature for 30 minutes. In this post you can see how to make chocolate leaves. Once they are done, sprinkle with cocoa powder. In a saucepan add the isomalt and place at medium heat. Leave until it melts completely, but without exceeding 320ºF/160ºC since it would take a yellowish coloration. The perfect melting point, you will reach around 230ºF/110ºC. Remove from the heat and, with the help of a fork, simulated drops on a plate. Let them cool, it will take a few seconds. Take the drops with the help of tweezers and place them on the chocolate leaves. Prepare the base of the cake. Melt the 35 g of chocolate and mix with the oil until a homogeneous mixture is obtained. Brush the entire surface of the cake with the chocolate. With this we manage to waterproof the lower part of the sponge cake. Refrigerate for 30 minutes to harden the chocolate. Place a baking paper on the side of the chocolate and turn the cake. Separate the baking paper, take care not to break it. Turn it over so that the chocolate side is facing down. 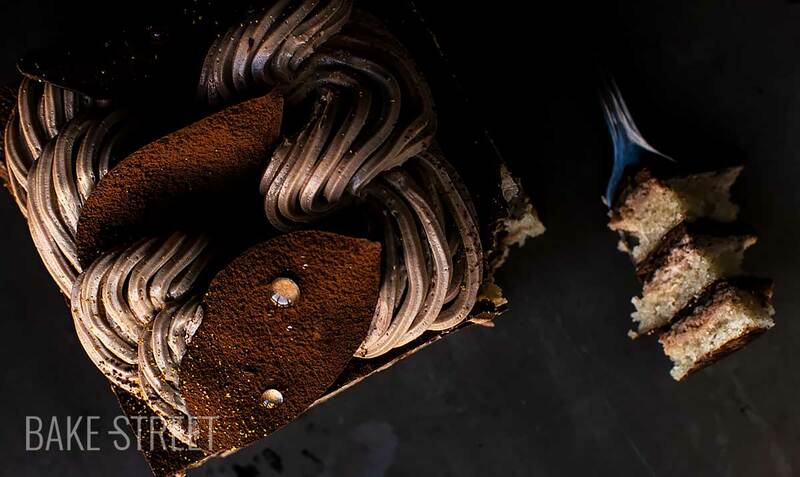 Moisten the cake with the coffee syrup, don't be afraid, it should be very juicy. In my case I used all the syrup. Put a good amount of SMBC and spread with the help of a spatula. We will try to leave it as smooth as possible. Place it in the freezer for 30-40 minutes so that the SMB hardens. Put a thin layer of ganache on the SMBC, spread with the help of a spatula. Place it in the freezer until it is firm. This way we are guaranteed to make clean cuts. With the help of a long, sharp knife, cut the sponge cake. In my case I have made 6 squares of 10 cm side to obtain 2 cakes of 3 heights and 10 cm side. But in your case, feel free to do it with the size and shape you like. Remember that the colder and firmer the cake, the better we will be able to cut it. Decorate the surface with the SMBC as I show you in the video. Leave at room temperatura for 1 hour. Decorate with chocolate leaves on top, sprinkle cocoa powder and gold edible dust. The ribbon stage is obtained by beating the eggs together with the sugar for several minutes. 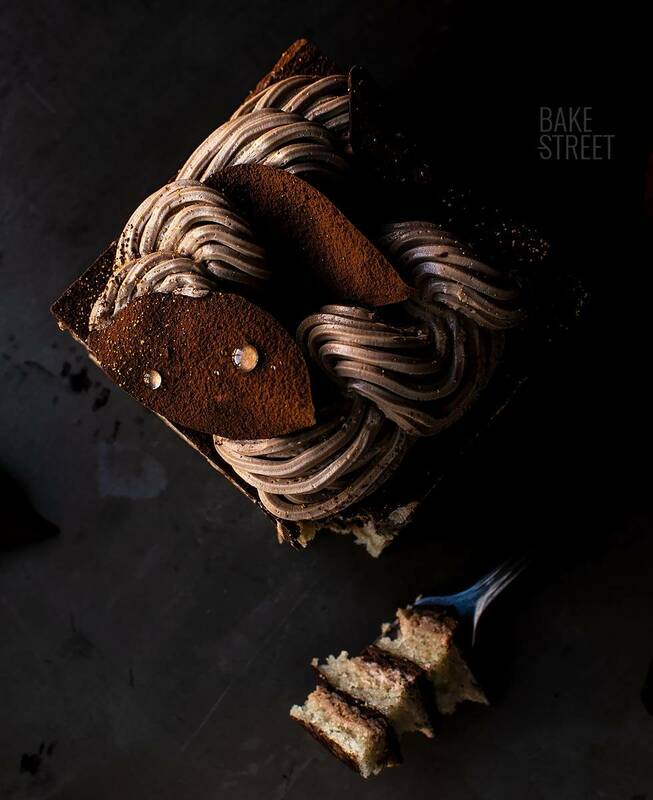 The mixture takes on a whitish colour and the texture becomes very thick to the point of lifting the whisk and being able to form a cord or ribbon over the mixture without deforming it. Hence the name. I have decided the process in 2 days to make it easier and bearable. But if you wish, you can do the whole process in just one day. If you don't have any coffee paste, that's all right. You can use chocolate cream instead, not Nutella because it gives an intense flavour to hazelnuts, which will help us add colour to the essence or extract of coffee. Follow all the steps to get a good SMBC. If we have SMBC leftovers, we can refrigerate it for 2 days or freeze it for 30 days. To make the syrup you can use the liquor you want. You will have leftovers syrup, you can keep it refrigerated inside the bottle for a long time. It is important to moisten cake, otherwise they may be dry. Don't be afraid to be generous, the result will be a very juicy cake. To get clean cuts, we must freeze the cake. This is the only way to obtain a clean and straight finish. We can keep it refrigerated for 3-4 days. Cover it or inside an airtight container to prevent the cream from drying out. 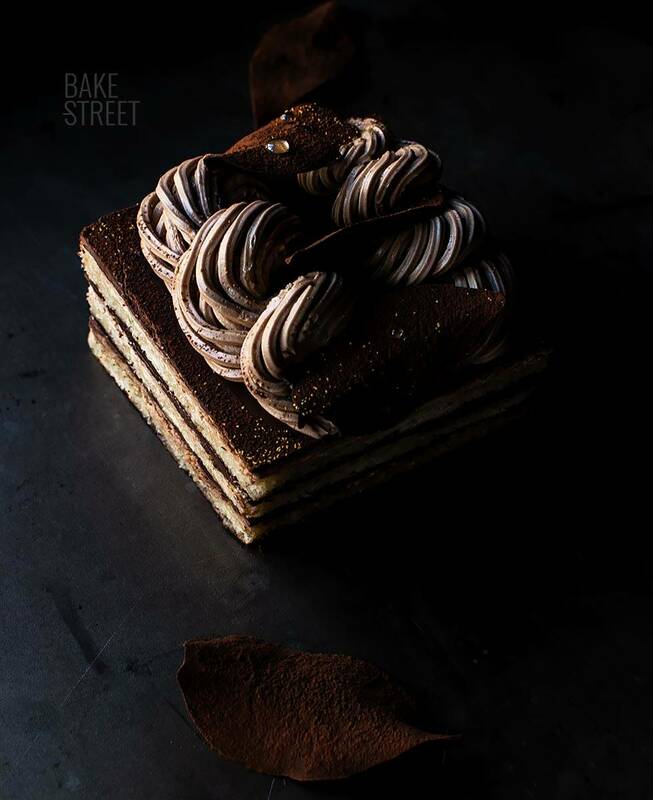 The Opera Torte is undoubtedly the perfect dessert and ideal to enjoy any day of the week. Yes, I know that I always tell you that it is the perfect dessert for the weekend, but it is so absolutely incredible that you should be able to eat it every day of the year. To get a good result, we must follow all the steps of the process well. An important point is to moisten the cake well. This should be very juicy, we must perceive a taste of coffee and liquor to each bite. 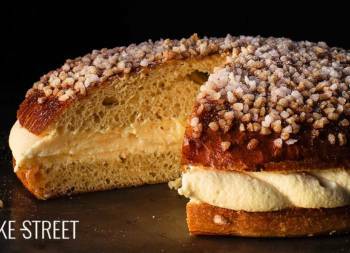 In addition to the texture of an almond sponge accompanied by two very creamy fillings. With this cake I have no end... I can eat anything I have in front of me, hahaha. I hope that you cheer up with it and tell me how it went. I wish you a wonderful weekend, see you on Monday!